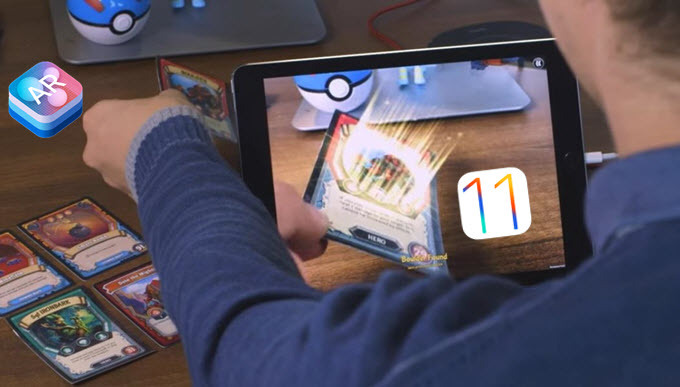 Apple recently released its latest iOS 11 a couple of days ago, and it’s packed will numerous features that includes ARKit, which provides optimal augmented reality experience for users of iOS devices. But for you to appreciate it, you must first have the ARKit apps for iOS 11. 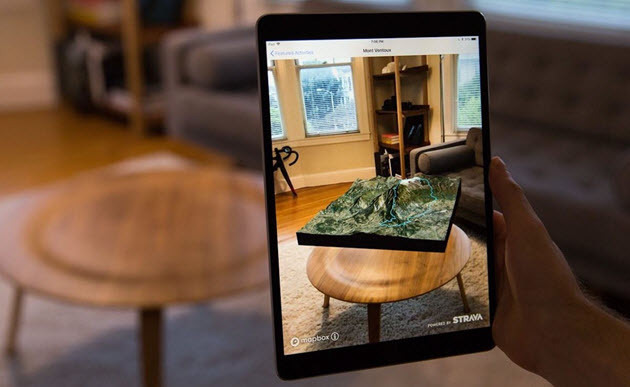 Many developers are now coming up with various applications that are equipped with AR features and to have a short peek of these apps, here are the top 10 AR supported apps and games. Are you tired of looking for any measuring tools like a ruler every time you need to measure something? Then here’s the perfect application for you. 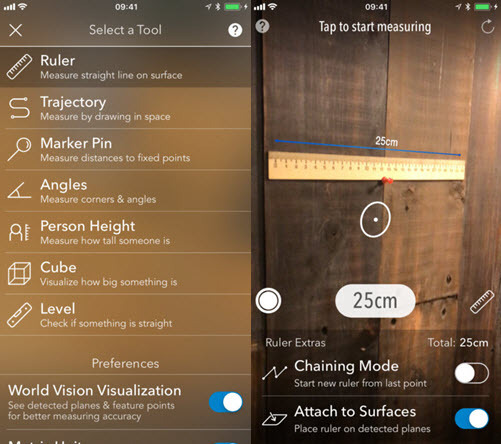 This ARKit app for iOS 11 helps anyone to measure anything that they wish to, from flat surfaces to boxes and circles, and many more. Simply choose the measuring function that you want to use and then point your camera into the object that you want to measure and this tool will do all the measuring for you. 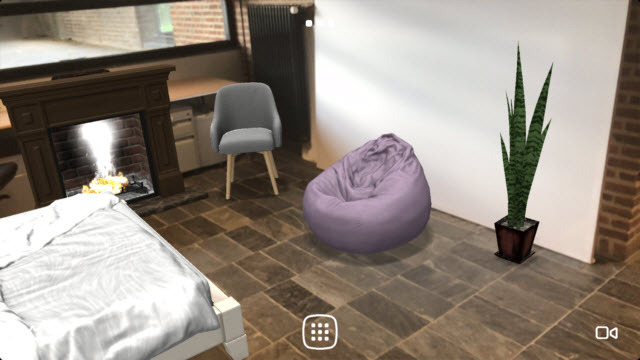 This application lets you decide the things that you’ll need to add into your home before actually acquiring them. So if you are planning to get a new sofa set, you can first check the size and the color that blends into your free space. You can also use it to manage the exterior of your house by adding flower bases, garden chairs, etc. It is definitely a helpful application to avoid purchasing house furniture and stuffs that do not match your preferences. 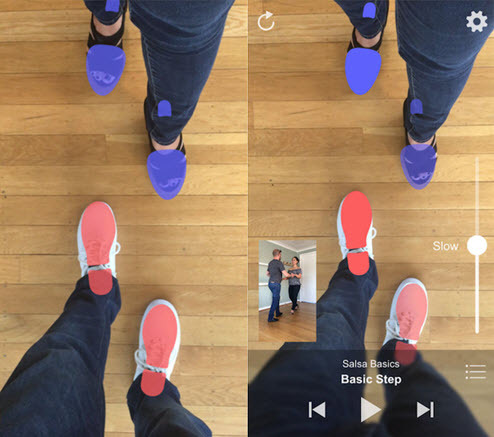 One of the best AR apps that you can utilize is this fitness application that will help you find a better place for you to jog. It is also perfect for cycling enthusiasts since it provides a 3D terrain map of the top cycling routes of all time. Once you started cycling, you can turn your iOS device into a GPS tool which tells you the exact location where you are heading. Prioritize your fitness and this application can help you with it. Want to learn how to go with the different dance genres? Then this AR app is the program that you are waiting for. Dance Reality serves as a professional dance instructor that shows you which foot to move, a demo, and a counting voice over to follow. It includes solo and couple practices to follow and video guides from various professional dancers. It’s fun and educative as well. 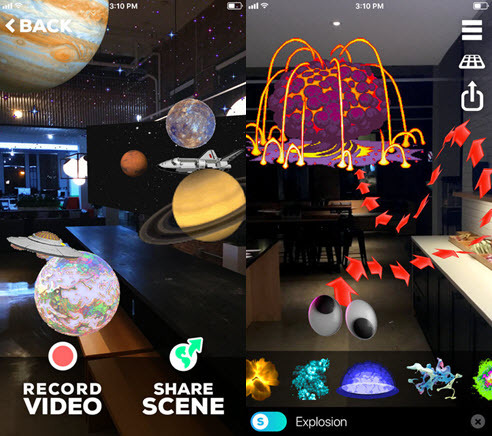 From the name itself, this application provides numerous GIFs and stickers with an AR 3D appearance. Now you can insert funny GIFs and entertaining stickers into your daily photos and video clips which you can share with your social media friends. Some of the things that you can add include an erupting volcano, a hamburger, flower, rotating planet, rockets, etc. If we talk of free AR games on iOS 11, Stack AR can be a nice one to have. 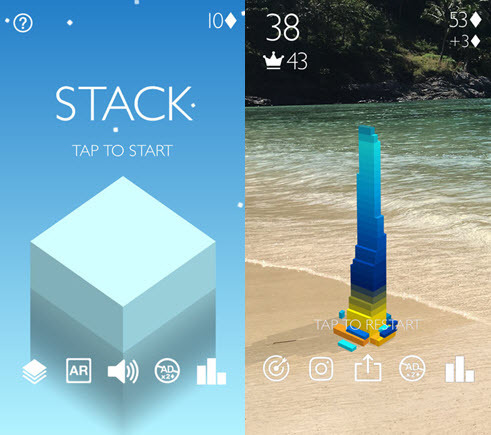 This game allows you to play the classic Stack game anytime you want without the need to bring game blocks. The graphics are simple yet pretty, and each top score from every user is saved into the game, allowing you to compete or break the top score across the nations. Want to join the zombie apocalypse phenomenon? Well this game will give you the kind of urgency that you want as you battle zombies inside a gunship helicopter. 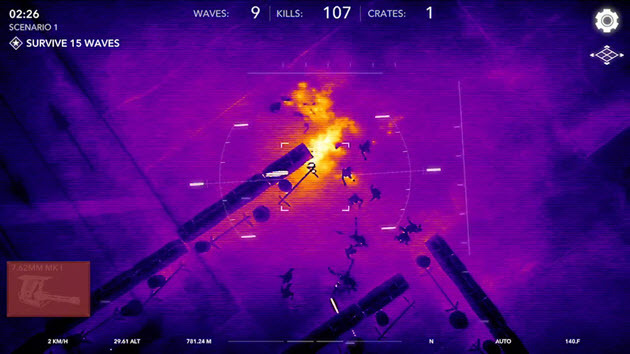 Its thermal camera graphics adds a more apocalyptic feeling to the game. There are different weapons that you can use to kill the attacking zombie. You can use Gatling guns, rockets, cannons, sniper pod and so on. If you want to last longer in the game you must upgrade your arsenal to have a stronger offense against your rotting enemies. 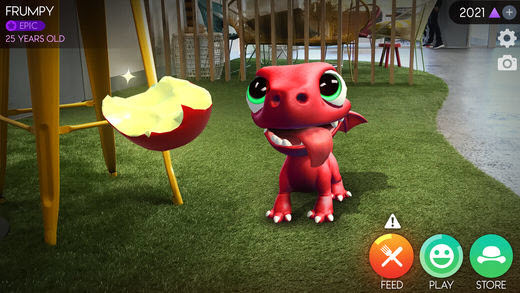 If you prefer cute Augmented Reality Games, then consider having AR Dragon. A huggable dragon pet that you can take care and play. It will start in a dragon egg and you can start taking care of it as soon as it hatches till it matures into an adult dragon. This game provides the same experience of virtual pet games with the twist of AR technology making it a must have game. This game will give you the satisfaction of getting in inside a robot and shoot the bad guys around. Warhammer 40,000: Freeblade, allows gamers to choose the knight robot they want to use and start attacking enemies using powerful guns. To make your robot stronger, you can upgrade your armor and weapons. You can also complete daily tasks to get additional rewards, plus it has a multiplayer mode in case you want to play with other gamers. 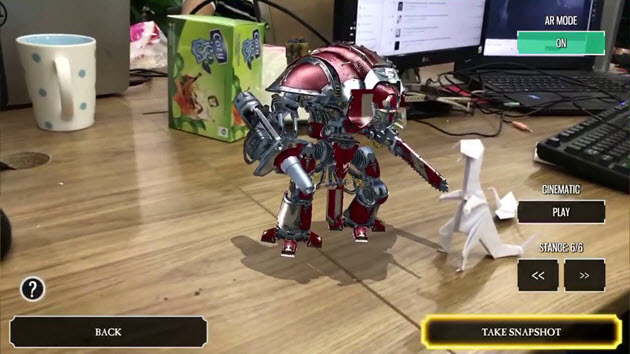 The ideal robot game that is blend with AR feature makes it a great game to play. This game is ideal for pool fanatics that have no extra time to go into a pool hub to play. 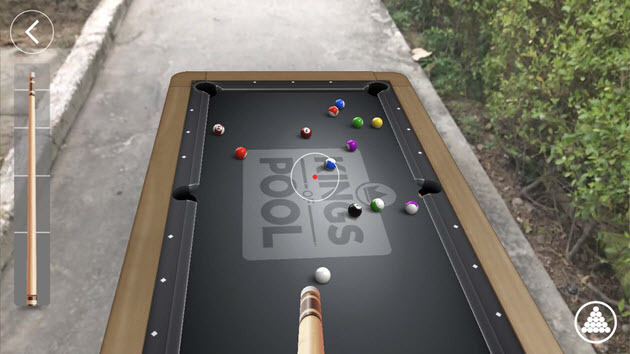 With the addition of AR function, playing this game will give you the same experience as in case of an actual pool game. You can easily adjust the angles and the view that you like upon taking the shot. This game will also give you the opportunity to play with other players around the word for a better pool experience. Those are the top AR applications and games that you can use for your iOS 11. All of these games are made to fit any iOS devices that support the iOS 11 with ARkit function. Feel free to try them all and choose the one that you would benefit from the most.